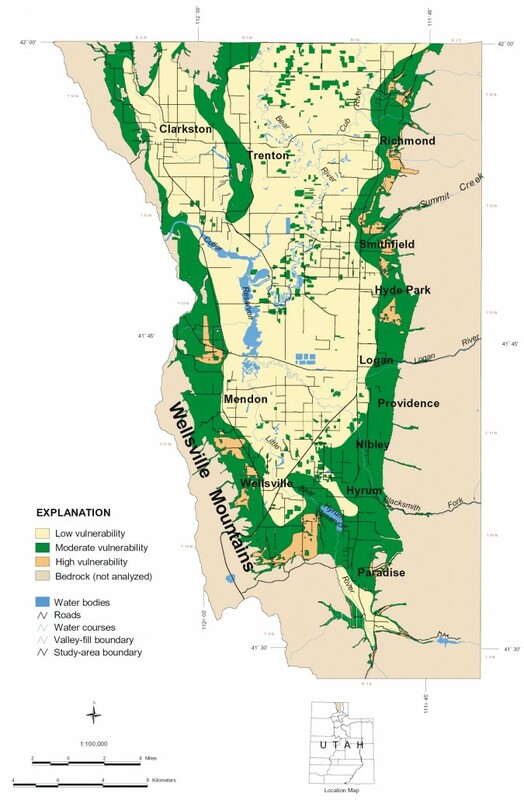 Ground-water sensitivity to pesticide contamination in Cache Valley, Cache County, Utah. The U.S. Environmental Protection Agency (EPA) is recommending that states develop Pesticide Management Plans for four agricultural chemicals that in some areas impact groundwater quality. These chemicals—herbicides used in production of corn and sorghum—are alachlor, atrazine, metolachlor, and simazine. All four chemicals are applied to crops in Utah. In some areas of the United States where these crops are grown extensively, these pesticides have been detected as contaminants in ground water. Such contamination poses a threat to public health, wildlife, and the environment. 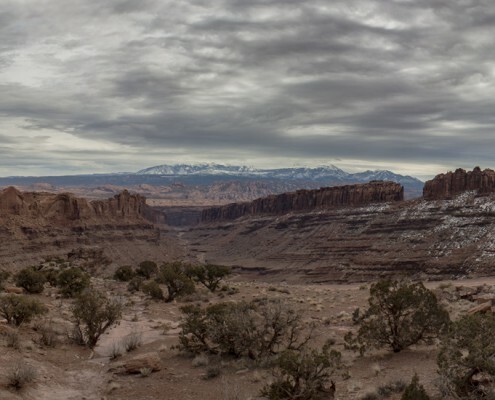 In many rural and agricultural areas throughout the United States—and particularly in Utah—ground water is the primary source of drinking and irrigation water. 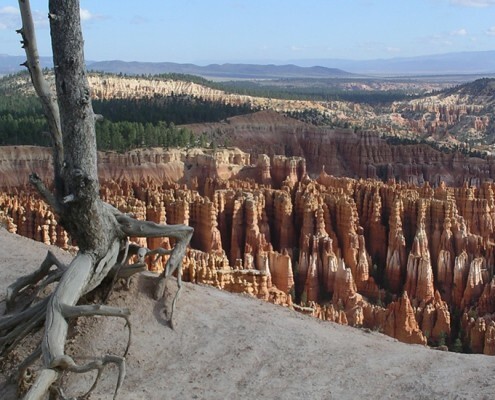 The state of Utah is committed to preserving the quality of its groundwater resources. 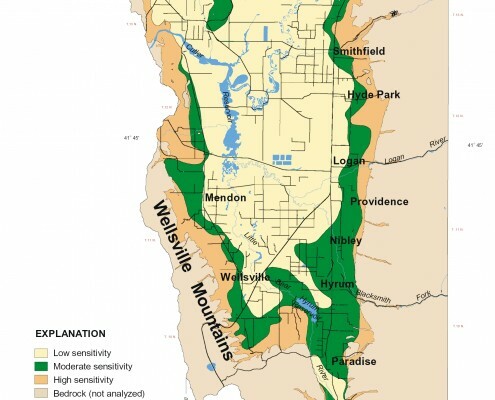 To aid in this effort, the Plant Industry Division of the Utah Department of Agriculture and Food and the Utah Geological Survey are producing maps to provide federal, state, and local government agencies and agricultural pesticide users with a base of information concerning sensitivity and vulnerability of ground water to agricultural pesticides both statewide and for specific basin-fill aquifers in valleys with extensive agricultural activity. Cache Valley, in northern Utah, is the first of these valleys to be mapped; maps are also being developed for Utah, Goshen, and Pahvant Valleys, with others to follow. Sensitivity to pesticides is determined by assessing natural factors favorable or unfavorable to the degradation of ground water by pesticides, whereas vulnerability to pesticides is determined by assessing human-induced factors and their response to natural factors. Sensitivity incorporates hydrogeologic setting including vertical ground-water gradient, depth to ground water, and presence or absence of confining layers, along with the soils’ vertical hydraulic conductivity (a factor influencing the rate at which water moves downward through the aquifer material) and other physical properties. Sensitivity also includes the influence of pesticide properties such as the capacity of molecules to adsorb to organic carbon in soil and the degradation (chemical breakdown) rate of a pesticide under typical soil conditions. Vulnerability includes human-controlled factors such as whether agricultural lands are irrigated, crop type, and amount and type of pesticide applied. We use and interpret existing data to produce pesticide sensitivity and vulnerability maps through the application of Geographic Information System (GIS) analysis methods. In many rural areas, ground water is the primary source of water for human consumption, irrigation, and animal watering. Therefore, the occurrence of agricultural pesticides in ground water represents a threat to public health and the environment. The rise of the United States as the world’s foremost producer of agricultural products since the end of World War II may be attributed, to a significant extent, to widespread use of pesticides. Control of insect pests that would otherwise devour the developing crop, together with control of weeds that interfere with growth and optimum crop development, permit higher quality commodities in greater abundance at lower net cost. Effective use of pesticides often means the difference between profitability and financial ruin for an agricultural enterprise. When evidence shows pesticides are degrading the environment, harming sensitive wildlife, or posing a public health threat, two regulatory courses of action are available: (1) ban further use of the offending chemical, or (2) regulate it so that judicious use mitigates the degradation or threat. Since the four subject herbicides play an essential role in crop production and profitability, banning them outright is unnecessarily severe if the desired environmental objectives can be met by regulation and more judicious use of these herbicides. The case of DDT, a once widely used insecticide, illustrates dilemmas faced by pesticide regulators. DDT was removed from widespread use in the United States in the 1970s because of its deleterious effects on bald eagles, ospreys, and peregrine falcons. Populations of these once-endangered species have recovered to a significant extent 25 years later. An ongoing effort to extend the DDT ban worldwide is being hotly contested by advocates of its judicious use as a critical and inexpensive insecticide needed in developing countries to control mosquitoes that transmit the malaria parasite. It is further argued that, given the current regulatory apparatus, were the use of DDT to be re-evaluated today under rigorous scientific and regulatory criteria, it would be restricted to specific uses rather than prohibited. Federal government agencies have been aware of the growing problem of pesticide contamination of ground water since the early 1980s. In 1984, scientists from the American Chemical Society documented the occurrence of 12 pesticides in ground water in 18 states; in 1986, they reported the occurrence of at least 17 pesticides in ground water in 23 states. By the early 1990s, the EPA began formulating and implementing programs to address the problem. In 1985, the EPA published a standardized system for evaluating the potential for ground-water pollution on the basis of hydrogeologic setting. The method, known under the acronym DRASTIC, involves assigning numerical values to seven parameters and totaling a score. Under this system, the higher the score, the greater the assumed vulnerability of ground water to pesticide contamination. Ranges in the numerical score are easily plotted on GIS maps. Measured parameters include depth to the water table, recharge, aquifer media, soil media, topography, impact of the vadose zone, and hydraulic conductivity of the aquifer—with the beginning letter of key words in these parameters forming the acronym DRASTIC. Eventually, it became apparent that this method is unreliable in some settings, and that it fails to consider the chemical characteristics of the potential contaminants and their interaction with soil and water in the vadose zone. To address this issue, methods were developed for ranking the potential for pesticide contamination of ground water based on calculation of a retardation factor and an attenuation factor that characterize movement and persistence of pesticides in the vadose zone, respectively, which vary with different soil properties and different characteristics of specific pesticides. The EPA has developed guidelines and provided funding for programs to address the problem of pesticide contamination of ground water, including a generic Pesticide Management Plan to be developed by state regulatory agencies having responsibility for pesticides. 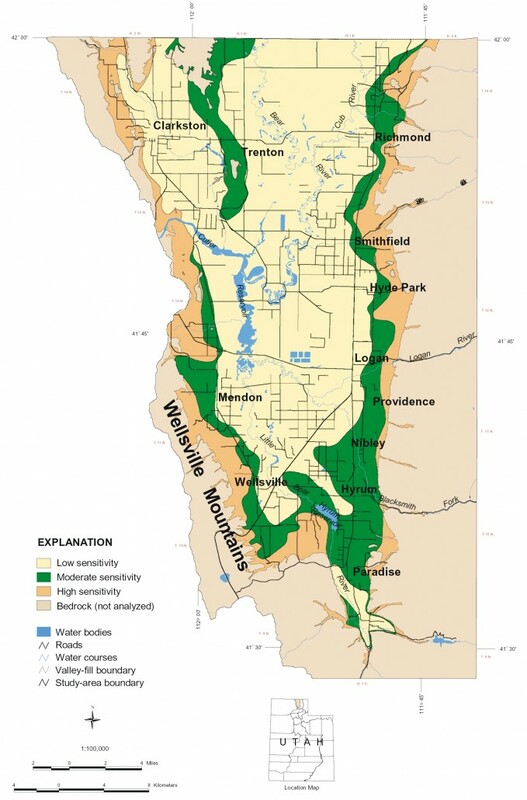 Utah’s generic (non-pesticide specific) Pesticide Management Plan was approved by the EPA in 1997; its implementation involves, among other things, establishment of a GIS database containing results of analyses of samples collected from wells, springs, and drains showing concentrations of pesticides and other constituents that reflect water quality, and development of a set of maps showing varying sensitivity and vulnerability of ground water to contamination by pesticides (this study). Since its inception in 1994, the Utah Department of Agriculture and Food’s sampling program has revealed no occurrences of pesticide contamination in any aquifer in over 1,500 samples tested statewide. We divided pesticide sensitivity into “low,” “moderate,” and “high” categories using the factors described above. Numerical ranking for each attribute category is arbitrary, but reflects the level of importance we believe the attribute plays in determining sensitivity of areas to application of agricultural pesticides; for instance, we believe hydrogeologic setting is the most important attribute with respect to ground-water sensitivity to pesticides, and therefore weighted this attribute three times more heavily than the other attribute categories. A sensitivity attribute of low was assigned when the numerical ranking ranged from –2 to 0, a sensitivity attribute of moderate was assigned when the numerical ranking ranged from 1 to 4, and a sensitivity attribute of high was assigned when the numerical ranking ranged from 5 to 8. We divided pesticide vulnerability into “low,” “moderate,” and “high” categories using pesticide sensitivity, areas of irrigated lands, and crop type. Once again, numerical ranking for each attribute category is arbitrary, but reflects the level of importance we believe the attribute plays in determining vulnerability of areas to application of agricultural pesticides; for instance, we believe ground-water sensitivity to pesticides is the most important attribute with respect to ground-water vulnerability to pesticides, and therefore weighted this attribute two times more heavily than the other attribute categories. The small versions of the sensitivity and vulnerability maps (shown here) show our results. The main sources of recharge to the basin-fill aquifer in Cache Valley are surface streams that originate in areas of higher elevation and then flow into the sediment-filled basins. 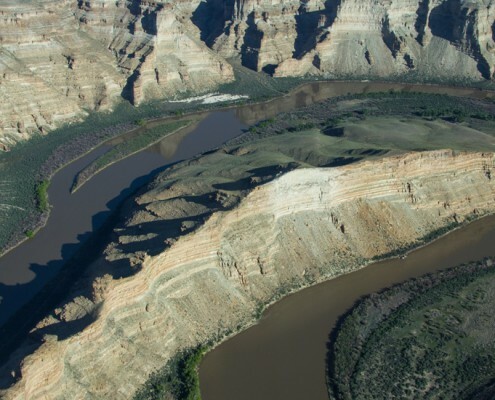 Areas where rivers and streams cross valley-bounding faults and coarse-grained alluvial fans have the most urgent need for protection to preserve ground-water quality, based on the results of our ground-water sensitivity and vulnerability mapping. 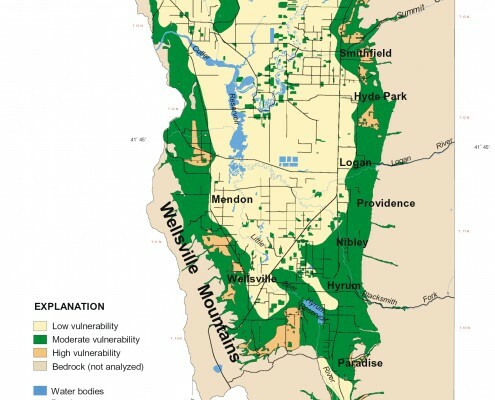 Other valley-margin areas (see map), particularly those with unlined or poorly lined irrigation canals, also warrant measures to protect groundwater quality. However, because of relatively high retardation and attenuation of pesticides in water in the vadose zone, it is unlikely that pesticides applied to crops and fields in Cache Valley represent a serious threat to ground-water quality. Based on these conclusions, we believe ongoing ground-water sampling in Cache Valley should be concentrated in areas of moderate and high sensitivity or vulnerability, typically along valley margins. Sampling in the central area of the valley characterized by low sensitivity and low vulnerability should continue, but at a lower density than in the areas of higher sensitivity and vulnerability. Areas where data are unavailable, particularly areas lacking shallow ground-water data, were treated conservatively (in a manner protective of ground-water quality), by assuming that conditions most susceptible to pesticide pollution of ground water are present. This conservative treatment is particularly evident in valley-margin areas where depth to the water table is generally deep, but where GIS analysis presumed the water table to be shallow due to a lack of map data. Therefore, our maps show higher sensitivity and vulnerability to pesticides than what actually may be the case in those areas. Ground-water sensitivity and vulnerability to pesticides in such areas should be re-evaluated when better data become available.